When a vendor or salesman uses false statements, duress, exaggerations or misleading advertisements to win a Texan’s business, he or she violates the Texas Deceptive Trade Practices Act (DTPA). Every year, fraud and deceptive business practices cheat consumers and business customers out of billions of dollars. When businesses lie or ignore provisions of their agreements, you have a right to fight back. If you feel the company you are doing business with is not treating you fairly, you are not alone. As a consumer it is important to understand the provision the Texas Deceptive Trade Practices Act provides to be protected from certain acts of conduct in business. What Conduct is prohibited by the Act? To determine if you as a consumer have a Cause of Action as a result of a violation covered in the Deceptive Texas Practices Act, the best way to protect your rights is to immediately contact an experienced Deceptive Trade Practices Act attorney. 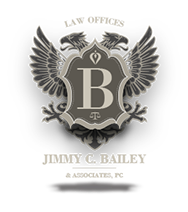 Jimmy C. Bailey and Associates, P. C. is prepared to bring forty successful years of ability, expertise and resources to represent each client with skill and understanding. * Businesses with more than $25 million dollars of assets, or controlled by a corporation or entity with more than $25 million in assets, are excluded from coverage by the DPTA.